INS Affordable MLM Software features allow you to be MORE PROFITABLE when compared to other MLM Software. Enterprise MLM Software, Multi-Lingual, Multi-Currency. INS Affordable MLM Software can get a new MLM Company or Network Marketing Company started, or take an existing company to a new level of business efficiency, making you MORE MONEY. MLM Software Testimonials from our clients! Ask us about our "Share in the Risk" MLM Software Pricing. MLM Commission Calculation - Your Custom Multi-Level-marketing Commission plan built to your specification! 40 hour allowance to build included in MLM software purchase. Uni-Level Commission Plan, 3x8 Matrix, Binary Commission Plan, Binary Unilevel Hybrid, Straight Line Plan, 2x2 cycling matrix, Australian 2 up(aussie 2 up), Coded Bonus Plan, Fast Start Bonus, Infinity Bonus, Matching bonus, Check Match Bonus, if you can dream it, we can build it! Run and Re-run as often as you need to get it right before pushing Pay. Other Payment Out options per your needs. Fully Bootstrap and Mobile Responsive Back Office Environment for FULL Mobile Support across all Mobile Devices, SmartPhones, Phablets, AND Tablets! MLM Communicator Mobile Application - members can get all corporate email blasts directly to their smartphone as a push notification in real time vs emails which are unreliable in today's MLM environment. INSTANT communication! Retail Engine - in light of Herbalife's $200 million fine, we have added a retail engine to allow members to track their retail sales to keep you compliant. Add/Edit Change all but Name, including addition of multiple addresses or payment types. Replicated Website "About Me" Page control and prospect info collection form. Genealogy File Structure type viewer. Personally sponsored member and customer list. Calendar for Corporate Events tracking and personal use. Administration notes and Support Ticket understanding area. Recognition Story and photo area. Facebook, Twitter, LinkedIn links on Replicated website about me page. Rotating Autoship Feature - allows you to have a set of products that are sent in order month after month as autoship vs. a static autoship. Weighbill Entry - Enter Weighbills by hand, barcode reader, or if you are integrated with a logistics company, it can happen automatically. Commission Run - Run, rerun, pay. Tax Exemption - set tax exemption rules for items, and or Members with State Tax ID's etc. Upload Engine - upload files for use in backoffice or public/custom pages in your replicated site. Gift Certificate - list of all gift certificates issued in the system for tracking. Calendar - add events, approve member events for sharing with all calendar users. Admin Configuration Area - Video Demo 9min 55sec. Admin Replicated Website Skin and Multi-URL engine allow you to run multiple look and feels connected to specific shopping cart categories and FAQ categories allowing you to run multiple scenarios segregated at prospected area, yet integrated for members commissions. Admin Theme Graphics Control - 3 styles out of the box, or you can customize your own as well. Terms and Conditions engine and version control. Downline Viewer Configuration, set what information Admin can see vs. what members can see on their personals or non personals, includes options like, First and Last Name, Phone Number, Email Link, Volume Purchased last week, Current Autoship Volume Set, Volume so far this period, Qualified for this period, Rank, Leg Count. Admin User control - up to 8 access security levels for admin users. Users can be locked to a country or countries, and to warehouses for very granular data access. System Prefs control to control over 200 variables on how your system is configured, or change configuration on the fly including company name phone number etc. Shopping cart configuration including tax methods and currency control. Tax Table Control - American, Canadian, Australian, Euro VAT, Japanese and any other tax system supported. Corporate Entity Tax Exemption Control - exempt member from State/Provincial tax if paperwork on file. Comms Setup to control simple titles etc. in your custom commission plan. Distributor Support Interface (CRM) - Video Demo 7min 25sec. Member communication interface to use above search capabilities to get your subset of members and post a note to their members lounge, as well as email to them internally and email them externally all at once. Distributor Maintenance area - edit all client details, add unlimited addresses, Personal Account Update, add or subtract funds in commissionable or non commissionable way. Invoice listing with ability to change status, refund, set paid, set unpaid, delete, set shipped on an individual basis. Members team summaries and genealogies. Flag Update area to allow a member to not need to meet commission criteria to get paid. Enable Holding tank and/or Re-Position Functionality. Admin Order (for offline order capability) - backdate capable -optimized for quick data entry. Order Refund - partial refund capability. 3rd party CSV file export Single file format or Dual File format or XML format. CCard Blacklist - add known cards with issues to blacklist so they are never transmtted to your gateway. Automatically add to FAQ any support tickets that are generic and useful to your members. Unapproval of FAQ - used to take an FAQ off the public list. Approve as Non-Members, Members, or Admin FAQ item. 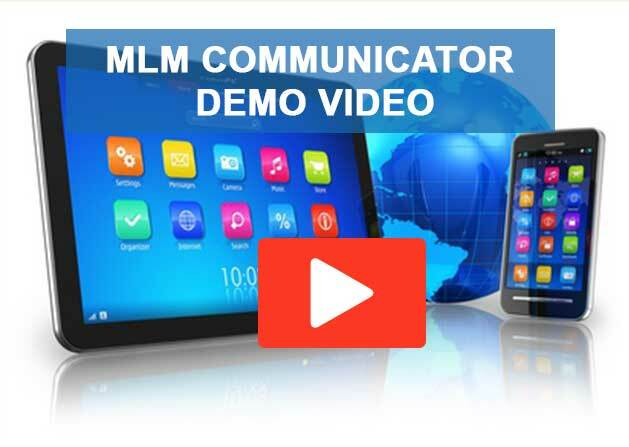 MLM Communicator Mobile App connects to members area to allow reciept of push notifications direct to phone, allow direct login to members back office, and even send blasts to your own downline by push notifications. Calendar Control to add corporate conference calls, meetings etc. to all member backoffice calendars. Member communication interface utilizes extensive member search capabilities to get your subset of members and post a note to all their members lounge, email to them internally, externally, and stamp note in CRM area of distributor maintenance, all at once. Integrated Moderated Forums available for any clients who would like them, turned OFF by default due to learning curve. Translate to as Many languages as you wish. Easily issue translator passwords to motivated members without risk. Webeditor CMS System allows for translators to make easy duplicates of pages to translate without design skills. Approval based translation system allows for translation to NOT go live until admin approval. Search for translatable text by page, word, text string, or all untranslated items. Full versioning system built in. Sales Summary - Total Sales/Taxes/Freight per enabled Currency by date range, breaks out commissionable and non commissionable sales as well. Sales Graphs - Current Period, Previous Period, set period Daily, Weekly, Annually, Yearly, or By commperiod, then shows comparatives of last month vs this month, and same periods a year ago. Sales Item Detail - by order date, paid date or commperiod, date selectable, show by country, or all, and paid or unpaid or all orders. Shows by cart category, all items and who bought each one as well as price volume and taxes. 1099 - report to use to generate your 1099's for American clients. AutoShip - Shows all members, their autoship day, volume, date of last autoship, Order Status and Signup Date. Hotlinked to Distributor Maintenance. AutoShip Product - Lets you select a list of all users on autoship for a particular product, shows username, item code, Country shipping to, Quantity, and Ship Day. Commissions - By date range, shows who earned how much and their username and real name, hotlinks to distributor maintenance. Qty Sponsor - By Date Range, and Referrer, Shows total sponsored, name, username, phone number and email. Often used for recognition phone calls. Signups - By Date Range and Referrer, All Signups showing Username, Name, Date of Signup, Sponsor and Autoship Volume. PSVolume - By Date Range, and you can select, top 10, 20, 30, 40, 100 to show total personally sponsored volume. Shows Username, Name, Personal Volume, and Personally Sponsored Volume. Cancel - By Date Range and Referrer, shows all Cancelled members username, name, signup type, date cancelled and sponsor. Suspended - Shows all Suspended Members and allows you to terminate from within report. Commission Period Summary - Shows metrics from your commission plan by commission period, and allows you to get a csv report of full details of pay by member. Member Personal Account Balances - Shows total balance of each members personal account by currency, you can select sort order by balance, id, username or name Ascending or Descending. You can export this report as a CSV. Check Report - A list of all checks, who they were written to, how much for, and check number. Awstats - Web statistics for your site by AwStats. Tax Summary - report for preparing your Sales taxes, or GST or VAT, if you are not using a service such as Avalara. Login/Pageviews Graphs - Graphs of how many logins/pageviews you have had by time frame. Any report you need can be made for you upon your spec. Corporate Push to keep members updated with latest corporate version if they wish. Advertising Co-Op Engine for tracking money in the co-op and money placed in ads and where. Coupon Engine - A Groupon type engine. This list is constantly changing, so if something you need is not written here, please don't hesitate to contact us to see if we have what you need, or something that can easily substitute. Every client gets Issue tracking software to ensure no details are ever lost, no "emails" go astray creating costly time delays, and all staff, yours and ours are kept on track and accountable. Support by Skype text and voice (with appointment), and even Telephone if and when required.